Where is poetry found in the Bible? Poetry is found in many places throughout the Bible. In the New Testament letters, hymns and songs in the form of poetry are often quoted (as we have looked at on previous days). In the Gospels, poetry is often quoted from the Old Testament. The most common places poetry is found is in the prophets and the Psalms of the Old Testament. 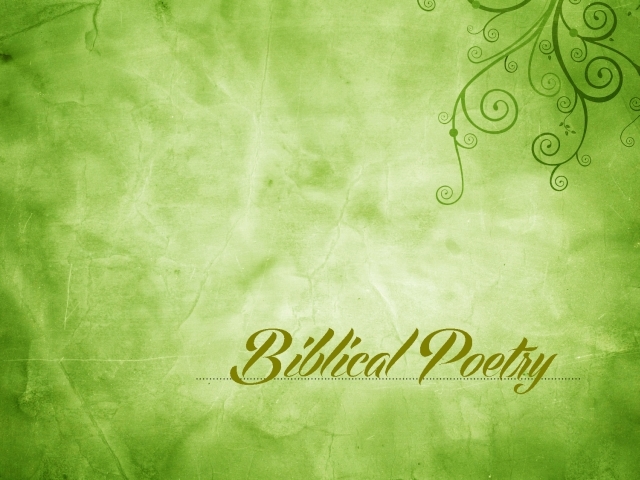 How should we interpret poetry in the Bible? Poetry should be looked at in a different way than other forms of literature. If you read poetry in the Bible in the same way as other genres, you will miss out on some of the rich meaning and at times misunderstand what is written. Poetry is usually filled with symbolism and often speaks more to the heart, sometimes communicating emotion rather than a logical set of principles. In the Psalms we often hear examples of people conveying their feelings to God. In the prophets we often hear God conveying His thoughts and feelings toward His people. Let’s focus on the Psalms. There are many different kinds of psalms in the Bible, these include: Psalms of praise and thanksgiving to God, psalms about God’s chosen king in Israel, liturgical psalms, and psalms of lament. Is it surprising to know that the majority of these are psalms of lament? Most psalms are prayers calling out to God for help—poems about how the writer is suffering, oppressed or viewing unfairness in the world. Some Psalms are even about how the writer is frustrated with God directly. They may be asking God why He allows suffering and injustice in the world. It is here where we learn something essential about how we should communicate with God. The psalmist tells God exactly how he feels, he communicates respectfully, but does not hold anything back. He is completely honest with God. The question is, is this appropriate for us to do this? Let’s consider the story of Job. The book of Job is almost all poetry. It is basically about a man, Job, who has had everything, including his health, taken away from him. In this book, Job spends much of his discourse about how he believes his suffering is undeserved and his feelings and thoughts as he struggles with how God could have let this happen. His friends keep responding to him, offended by his words, and constantly defending God. But in the end, it is God Himself who speaks, and everyone is surprised. The passage clearly indicates that it was Job’s friends, who, although they tried to defend God’s position, did not speak accurately about God. It was Job, in his honesty, who spoke accurately. Job teaches us that it is essential that we are honest with God, even if we are not happy with Him. There are many examples of this in the Psalms. The Psalms can teach us how to communicate with God. It is here where we see people passionately crying out to God—in joy, heartache, praise and frustration. 1. How honest are you when you pray to God? 2. Refer to your Prayer Journal. Who would you like to remember to pray for this week? Is there anything from Job that you would like to thank God for, or anything that challenges you? Hi, it was pointed out on Sunday by Ms.Meg Slater that I used the Acronym “btw”, and I thought I should clarify that that means “by the way”, thanks, Ms.Meg!! !